We have thousands of properties for sale all over France. But we've no property for sale in Saint Omer at the moment. And that's something we want to change. If you have a property to sell in Saint Omer (or nearby) then act now to get a 50% discount. Just place your advert in the normal way (Click here to place your advert). Then send us an email quoting "Saint Omer" and telling us that you you saw this offer. Saint Omer, in the Nord Pas-de-Calais, is a town that is often overlooked by visitors to France as they head South and West for the better-known regions of Brittany and Normandy. It has, however, some attributes which render it worthy of a second glance, particularly for the serious second home house hunter who does not wish to venture too far from the easy access offered by the port of Calais. 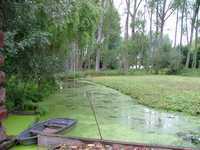 Saint Omer is also attractive to walkers and wildlife enthusiasts as it is bordered by the lovely and extensive Audomarois marshes that provide a safe environment for many unusual and delightful species of wildlife. The less energetic can take a boat trip through the waterways to enjoy this very special region. The town itself is known for its history as a religious centre over many centuries. It was named for the Benedictine monk who arrived in the area in the 7th Century to bring Christian teachings to the local people. St Bertin's Abbey was built at this time but was destroyed in the 13th Century. Rebuilt as a very beautiful Gothic church, it gained a fame of its own until the French revolution, when sadly it was destroyed again, leaving only the ruins that can be found today near to the railway station. An interesting feature of the town is the 'Circle of Giants'. These are huge figures traditionally made of wicker and they meet in the Place Foch, the main square, once a year. The town has its own 'Géant', named Batistin, who is said to represent the farmers from the Audomarois marshes and who plays a traditional role in Saint Omer's festivities and processions. Although it is rare to find a good sized town in France which doesn't host its own market once a week, Saint Omer has a special claim in that the produce sold in the market comes almost exclusively from the unusual and fertile marshes of the region. Held every Saturday, the market is a meeting place for the townspeople as well as a place to buy the freshest and best of local produce. The clue is in the name of the department in which Saint Omer is found, the Pas-de-Calais. The port of Calais is only a half hour drive along the A26 Autoroute, making Saint Omer an excellent place to buy if you are seeking a weekend retreat from the hustle and bustle of UK life. Just hop on the ferry at Dover and you are nearly there! Property in and around Saint Omer is still an exciting investment, as prices here are lower than in many regions of France and compare particularly well with prices for similar properties in Brittany, for example. Do you know Saint Omer better than we do? Do you have photos of Saint Omer? Saint Omer is located in Northern France on the border between Artois and Flanders. In the north of the Pas de Calais department in the region of Nord Pas de Calais. Access: Ferry from Dover to Calais,then A26 Autoroute. Economy: Soap, Linen, Oil Distilling,Salt Refining, Liqueurs,Tobacco Pipes, Malting and Brewing! Interesting fact: The people who live in the marshes around the town (the Audomarois) are the only residents in France who must have their mail delivered by boat!